What can you do in 1,000 days? In Rwanda, you can save a child’s life. The 1,000 days between a woman’s pregnancy and her child’s second birthday are critical to shaping the child’s future. Ensuring good nutrition during a child’s first 1,000 days can impact physical and mental growth—as well as the future of entire societies. 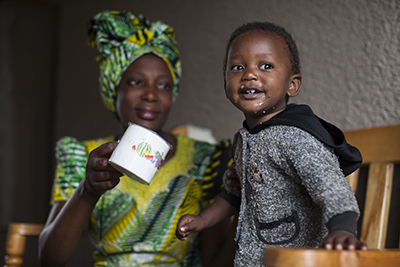 For children and infants under age 2, the consequences of malnutrition can be severe and irreversible. Unfortunately, malnutrition is still a leading cause of death throughout the world. Despite government efforts, the rate of stunted growth in Rwanda remains high. In 2010 it was 44%—today the latest Rwanda Demographic Health Survey for 2015 still shows a stunting rate of 38% and in certain districts, like Nyabihu, as high as 52%. Babies who are malnourished in the womb have a higher risk of dying in infancy. Children whose growth is stunted can have weakened immune systems and be more susceptible to dying from common illnesses like diarrhea or malaria. In addition, they’re less able to perform well in school later in life and are less likely to find job opportunities as adults. With funding from the U.S. Agency for International Development, through a program that integrates health and nutrition with water and sanitation interventions, CRS and our local partners are targeting pregnant women, nursing mothers and children under age 5—with a special focus on children under age 2. By focusing on early interventions, we hope to contribute to the government of Rwanda’s effort to reduce stunting rates among children under age 5 to 29.9% by 2020, in alignment with Rwanda’s Fourth Health Sector Strategic Plan targets. Keza Evelyne is a healthy child. Looking at her it is hard to guess that she was once struggling with severe malnutrition. Her mother, Nyiracumi, has high expectations for Keza. She wants her to be healthy, complete school, help her family and contribute to the country’s development. When CRS began working with Keza, her little sister and her mother at the Village Nutrition School, Keza was alternating between severe and moderate malnutrition. Nyiracumi attended the classes focused on growth monitoring, rehabilitation of malnourished children, nutrition education, and other group member activities that include training in social and life skills. In the classes, parents bring their children who have signs of moderate malnutrition. Each parent commits to bringing ingredients: Vegetables, like fruits, beans, potatoes and bananas from home, and animal proteins, like fish and eggs, purchased using social funds from their saving groups, or eggs from small livestock provided by the program. This way mothers learn how to cook a balanced meal using what is available in their homes. Balance is important to this program. Fighting malnutrition in children means more than eating good food. That’s why families like Nyiracumi’s are being taught how to improve their crops. More than 80% of Rwandans work in agriculture to survive. CRS and our partners have established farmer field schools, where people learn agricultural techniques that help them grow better crops. Stronger crops mean diet diversity, more food for families and increased incomes. The program also focuses on building incomes. As part of CRS’ integrated approach, Elina Mukazikeye is a member of a CRS Savings and Internal Lending Community, or SILC, as well as a member of other Gikuriro groups. The savings groups bring people together and help them to save money. Elina participates in weekly meetings and has recently taken out a business loan to increase her chicken rearing and build the sales side of her business. “My son was never breastfed because he was born when I was sick, but thanks to the support I received from Gikuriro, I can feed him well. In addition to rearing the three chickens I got with Gikuriro support, I borrowed money from my saving group. I used some to buy five more chickens and some to start a shop that sells basic household stuff. Now my son eats three eggs every week. I am able to buy milk, sugar, flour and fruits for my family,” says Elina. “In the beginning, people don’t even think they are able to start income-generating activities. They start with as low as a $5 loan, and then they see they are able to produce more and reimburse on time with interest and most of them increase the loan to expand their activities,” says Anathalie Mukankusi, CRS Gikuriro economic strengthening advisor. “After paying back the loan, I plan to borrow more money from my SILC group and expand my chicken business. By August 2019, I will be rearing at least 100 chickens,” says Elina. 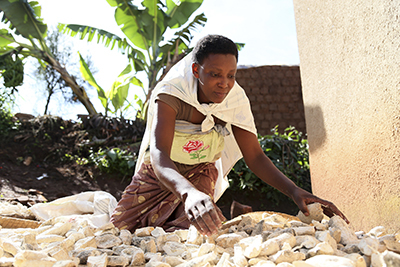 CRS’ work to end stunting in Rwanda is highly dependent on the commitment of local communities. 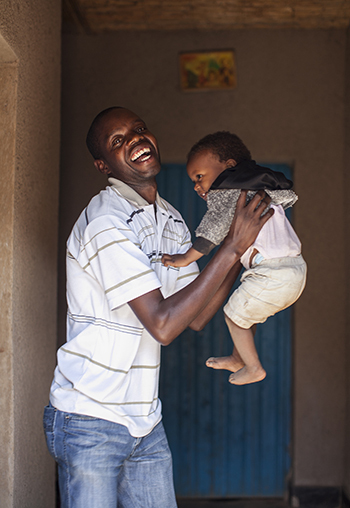 Fortunately, many communities share the government of Rwanda’s commitment to address stunting through a focus on early childhood development as an entry point in delivering health programs and activities. The program works hand in hand with the local government and local authorities.